I am unabashedly channeling Lionel Ritchie and his smooth, silky voice. 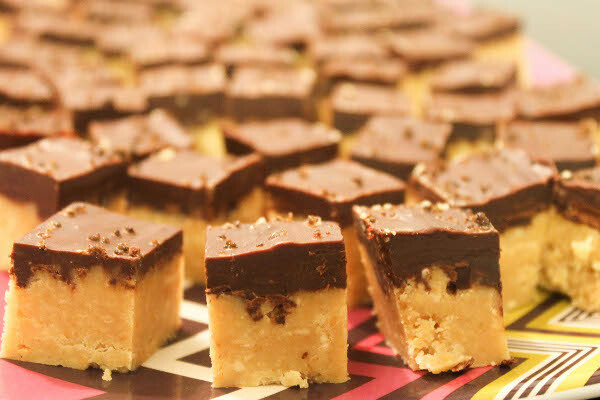 Because these peanut butter fudge squares are easy. Really, these salty-sweet squares are simple, casual, practically effortless. 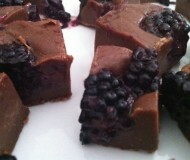 I’ve made easy fudge before – remember Nutella Fudge and Blackberry Fudge? 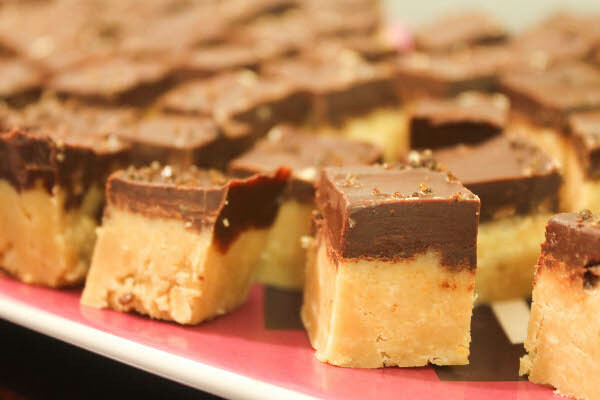 These Salted Peanut Butter Fudge Squares also only require a few minutes of work. And there’s no need to turn on the oven, either. It’s my latest try at microwave fudge and I’m still pretty amazed at how well it turns out each time. It is very quick to make, just needs a few hours to set, and voila! I end up with a dessert that’s well loved by all. For once, I didn’t use Nutella. 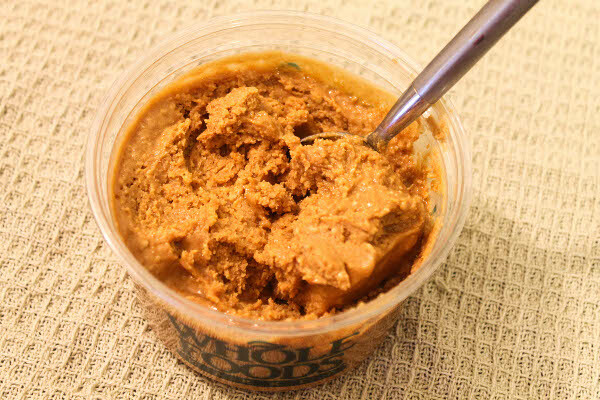 Instead I opted for something healthier: fresh ground peanut butter from Whole Foods. I used honey roasted peanut butter, but I bet this fudge will be great with almond butter, too. Of course I also used half a block of white chocolate and nearly a can of condensed milk, so that cancels out anything healthy. Plus some pats of butter. But whoever said fudge was healthy? It is, undoubtedly, a sweet, sweet indulgence. And with a top layer of smooth chocolate ganache and a sprinkle of dark espresso salt, it’s an indulgence you can readily whip up for a party or as a treat for your friends. Or you know, for a long weekend. Or weeknight class. Whatever. 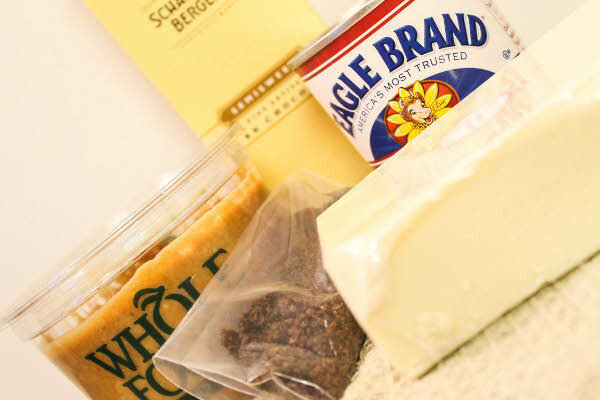 Combine the white chocolate, peanut butter, condensed milk, and butter in a medium microwave-safe bowl. Heat on full power for 1 minute, then remove and stir. Everything would have started to melt but you’ll still have some lumps. Heat again in 30-second intervals and stir until the mixture turns smooth. I heated everything for a total of 3 minutes. Scrape the mixture onto an 8×8 baking pan and smooth out the top. 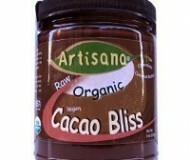 Make your ganache topping. Heat the dark chocolate in the microwave using the same method: 1 minute then stir, then in 30-second increments. Once it is melted, slowly pour in cream and stir until well blended. 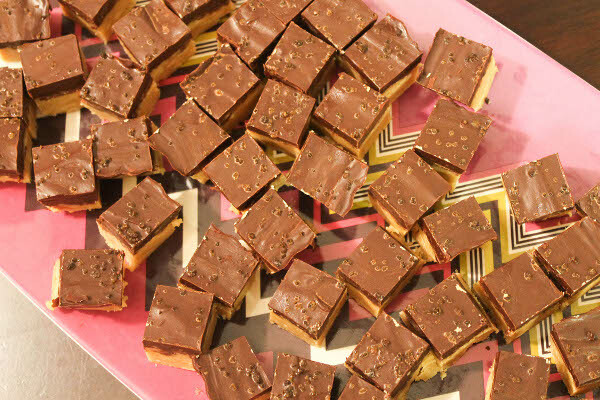 Pour the ganache on top of the peanut butter fudge, and sprinkle with espresso salt. Chill in the fridge for at least two hours, then cut into 1-inch squares. If you’re a purist or a perfectionist or if you simply have more time, you can melt the chocolate in a double broiler, and make ganache the proper way. 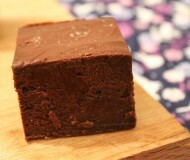 You can also be more careful about cutting the fudge into more even squares. But this isn’t a careful recipe. It’s easy. Like Sunday mornings. I love the fresh ground PB from WF. This sounds dreamy. I’ve seen so many simple fudge recipes lately…it’s like the universe won’t let me sleep until I’ve made a batch. Love the peanut butter in yours! I love how easy this is! They sound delicious. I can’t get over how gorgeous these look! And no steamy heat necessary! I’m going to cry these look so good. I kind of want to have a love affair with them. Lionel-style. I love the honey roasted peanut butter at Whole Foods–it brings me back to when I would eat cans and cans of those peanuts as a kid. It must make a great addition to this creamy fudge, and the ganache layer and espresso salt (!!) must put it over the top. Oh man, these look insanely delicious!! Wow. I love fudge, but sometimes I find it way too sweet (and I love things that our sweet!). Is this fudge super sweet or is the sweetness more subdued? Any post referencing Lionel Richie gets my approval :) That fudge looks awesome. 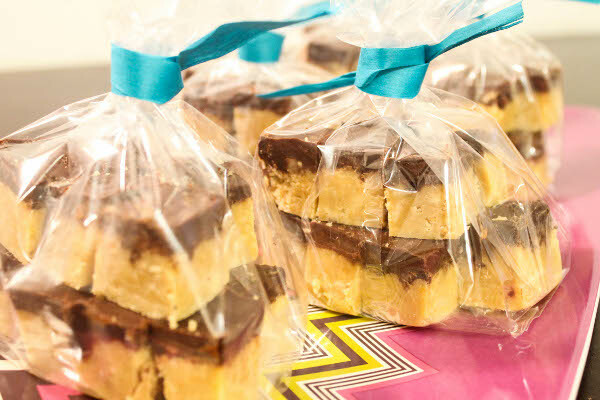 fudge is one of my favorite things to make but I’ve never tried one like this- I love the distinct layers! This is my kind of dessert…easy! And I’ve never heard of espresso salt, but that sounds really amazing on top. I really like that song. thanks for getting it in my head. the fudge looks scrumptious! this recipe looks like heaven.. so delicious and yummy. i love salted and sweet combinations when it comes to dessert. I love fudge variations and this looks so good!! Nothing better than fudge! That is one of the holiday treats my mom made that I loved most, maybe I’ll have to take over the fudge making duties next Christmas and make this one. Nothing better than an easy recipe to satisfy those chocolate peanut butter cravings we both know I get! Looks delicious! i happen to think that white chocolate and peanut butter combine most deliciously. this is a fierce batch of fudge, bianca! This is a match made in heaven! I need to try WF’s fresh ground peanut butter!